p. 93 - Not that a recipe is required for this simple but always tasty snack but I came across CW's version as I was flipping through the book looking for another recipe. The "variation" mentioned by EYB is a variety of fillings you can use to stuff your frico. In this instance I opted for the straight-up version. I was using a crappy "not-s0-non-stick" frying pan and I didn't achieve the wafers I normally do, instead I had frico rolls. Still tasty but didn't have the usual lacy visual appeal. The pan is now in the donation bag and balance has been restored in the bc kitchen! Always delicious though, regardless of the their appearance. Sound like Lucy's, but she didn't use any cheese. A little Turkish dish called "Albanian liver"
Delightful. Having some fresh mint leaves on hand, I added them to the salad and would do so again in the future. Bright and fresh testing -- better than the sum of its parts. I used pomegranate vinegar, reduced the onion, and added minced celery. Very nice. I steamed the carrots (rather than simmering in broth) and added a dried chile to the mix. Be sure to use a good quality olive oil. Since I don't like big pieces of anchovy, I used anchovy paste and stirred it into the olive oil. Usually use 1/2 green and 1/2 sweet peppers. ...and serve it with red wine vinegar. Delicious. A perfect use for all those bell peppers from the garden. It's definitely something I have to make every summer. Made for Barter group. It's HOT. I used it to toss with roasted potatoes and it was very good. 1 cup goes a LONG way. Around the Mediterranean these small foods are known as hors d'oeurve, amuse-guele, amuse-bouche, passatempo, antipasto, tapas, mazza, meze, zakuski, qimiyya, and adu, not to mention the host of snacks and streets foods that are so inviting. These little foods are becoming better known in America, where all of them are assumed to be appetizers... For me an appetizer is a preview, a taste of things to come. 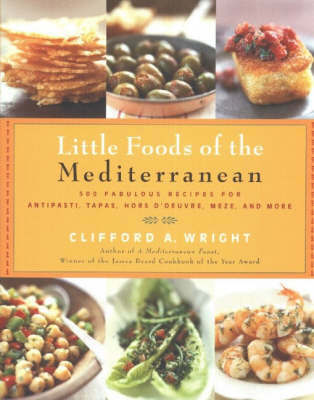 Every recipe in this book is an appetizer, but many recipes are much more, because throughout the Mediterranean it is not a shared culinary tradition that the appetite needs an opening, a stimulation. In many cultures, especially in countries of North Africa and the Near East, the notion of an appetizer is foreign. The book is an introduction to the way people eat in the Mediterranean. I understand that it will be used both as an appetizer book and as a book on the Mediterranean style of eating and you can feel comfortable with both approaches.